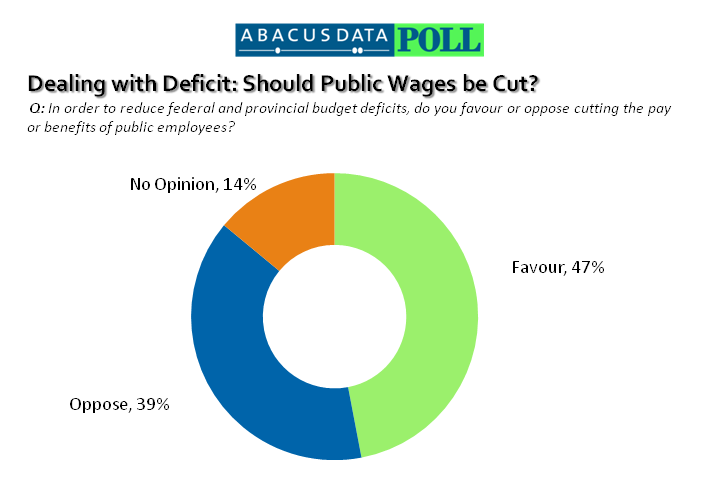 With the debate over how to reduce deficits a hot topic in Ottawa and in provincial a new poll from Abacus Data finds that Canadians are split over whether to cut public salaries and benefits as a means of reducing spending. Canadians were divided when asked if the pay of public employees should be cut to deal with federal and provincial deficits, with 47% in favour and 39% opposed to the idea. Regionally, Ontarians (52%) and Quebeckers (49%) were most likely to support cuts, as were Conservative Party supporters (57%). Interestingly, Albertans (34%) and British Columbia (41%) residents were the least likely to favour salary and benefit cuts in lieu of deficit reductions. Not surprisingly, when Canadians were asked whether public employees make too much, too little, or about the right amount for the work they do, Canadians were split. Overall, 45% of Canadians felt that the salaries and benefits of most public employees were too high for the work they do, with 27% saying they are about right, and only 8% that they are too low. “Even though there is a sense among Canadians that public employees are overpaid, the opinion is not a majority one,” said David Coletto, CEO of Abacus Data. “As governments across Canada look to reduce spending and reign in their deficits, cuts to public sector wages may be a tough sell with some Canadians. Based on these results, a debate about public sector reforms to pay and benefits will likely spark a heated debate as public opinion is strongly related to political preference,” said Coletto. From June 23 to 24, 2011 Abacus Data Inc. conducted an online survey among 1,005 randomly selected Canadian adults from an online panel of over 150,000 Canadians. The margin of error—which measures sampling variability—is comparable to +/- 3.2%, 19 times out of 20. Results of the survey were statistically weighted by gender, age, region, and education using census data from Statistics Canada and by past vote using Elections Canada results from the 2011 General Election. Totals may not add up to 100 due to rounding.